Portland /ˈpɔːrtlənd/ is a small city in Victoria, Australia, and is the oldest European settlement in the state. It is also the main urban centre in the Shire of Glenelg and is located on Portland Bay. The bay was named in 1800 by the British navigator James Grant, who sailed in the Lady Nelson along the Victorian coast. “I also distinguished the Bay by the name of Portland Bay, in honour of His Grace the Duke of Portland“, wrote Grant. The bay, the only deep sea port between Adelaide and Melbourne, offers a sheltered anchorage against the often wild weather of Bass Strait. By the early 19th century, whalers and sealers were working the treacherous waters of Bass Strait, and Portland Bay provided good shelter and fresh water, which enabled them to establish the first white settlement in the area. Whaling captain William Dutton is known to have been resident in the Portland Bay area when the Henty clan arrived, and is said to have provided seed potatoes for the Henty garden. In 1834, Edward Henty and his family, who had migrated from England to Western Australia in 1829, and then moved to Van Diemen’s Land, ferried some of their stock across the Strait in search of the fine grazing land of the Western District. After a voyage of 34 days, the Thistle arrived at Portland Bay on 19 November 1834. Edward Henty was only 24 years old, and, early in December, cultivated the land using a plough he had made himself. He was the first white man to turn a sod in Victoria. The next voyage of the Thistle brought his brother Francis with additional stock and supplies, and in a short time houses were erected and fences put up. Arrived at 6p.m., made the boat fast in the middle of the river, and started three days’ walk in the bush accompanied by H Camfield, Wm Dutton, five men, one black woman and 14 dogs, each man with a gun and sufficient quantity of damper to last for the voyage. On descending the hill we saw a native. He immediately ran on seeing us. He was busily employed pulling the gums from the wattle trees. By contrast, Melbourne, the capital of Victoria, was founded the following year in 1835 by John Batman. There in Portland the Hentys were “discovered” by the explorer Thomas Mitchell in 1836. The squatter settlement was illegal since, at that time, the British Colonial Office policy was to contain colonial settlements in Australia within geographic limits. It had been still considering how to deal with the rights to the land of Victorian Aborigines. The Hentys also farmed in areas known as “Australia Felix“, around Casterton. Bentinck Street looking north from Gawler Street. By 1838, land auctions had been authorised from Sydney and Charles Tyers surveyed the Portland township in 1839. “It was government policy to encourage squatters to take possession of whatever land they chose”. A Post Office was opened on 4 December 1841, the third to open in the Port Phillip District after Melbourne and Geelong. Around 1842 a Presbyterian church and school were founded by the Rev. Alexander Laurie (c. 1817–1854), who later ran the Portland Herald. His widow Janet Laurie (Black) and two sons founded The Border Watch in nearby Mount Gambier. The Gunditjmara are the traditional owners of the south west, taking in what is now Portland. They were present when the early commercial sealers like William Dutton arrived and when the Henty family created what would become Victoria’s first permanent European settlement. It has been argued whether Dutton was first, but he was considered to be somewhat itinerant by the establishment of the era and not the discoverer of this deepwater bay and fertile hinterland. Henty sowed the first Victorian wheat crop on cliff top land, known today as ‘The Ploughed Field’. One highly notable incident called the Convincing Ground massacre occurred in Portland Bay in 1833 or 1834 in a dispute about a Beached whale between whalers and the Kilcarer gundidj clan of the Gunditjmara people. Gunditjmara still reside in and around the district; they are renowned in scientific circles for their early aquaculture development at nearby Lake Condah. Physical remains such as the weirs and fish traps are to be found in Lake Condah, which is to the south of Hamilton. On 30 March 2007, the Gunditjmara People were recognized by the Federal Court to be the native title-holders of almost 140,000 hectares of Crown land and waters in the Portland region. On 27 July 2011, together with the Eastern Maar People, the Gunditjmara People were recognized to be the native title-holders of almost 4,000 hectares of Crown land in the Yambuk region, including Lady Julia Percy Island, known to them as Deen Maar. Portland was proclaimed a city on Monday 28 October 1985, in the presence of Their Royal Highnesses, The Prince and Princess of Wales. Today, Portland is a town of 11,872 (2018) residents. Portland is in the Victorian Legislative Assembly electoral district of South West Coast, the Western Victoria Region of the Victorian Legislative Council and the federal Division of Wannon. Its postcode is 3305. Boat marina in Portland Harbour, facing west. 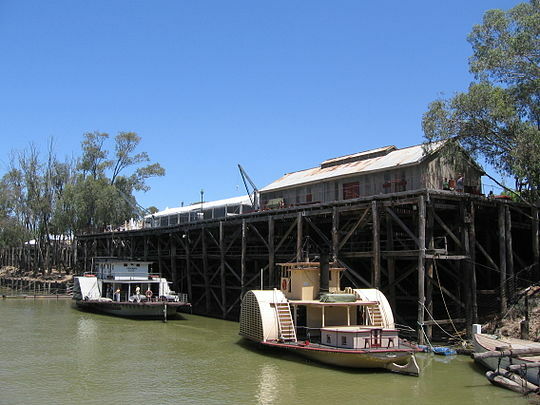 Through the 19th century Portland developed to become an important fishing port providing for the town and later, with the connection of the railway, to the region as far afield as Ballarat and eventually Melbourne. Barracouta, Australian salmon and crayfish (now southern rock lobster) were the main catches with many fishermen working the bay, around the Lawrence Rocks and in the season, Bridgewater Bay. Portland harbour enabled the development of the woolgrowing industry of the Western District, but has eventually it lost its primacy to facilities at Geelong. Even in western Victoria, Portland fell behind Warrnambool as the main commercial centre. In the 20th century Portland’s role as a port revived, and its economy was also boosted by the tourism industry and an aluminium smelter. The port of Portland was sold in 1996 by the State Government to a group including the listed New Zealand company Infratil & the Scott Corporation (owned by Allan Scott), the first privatisation of port facilities in Australia. Since then, it has been traded a number of times and is now owned by two institutional investors – the publicly listed Australian Infrastructure Fund and Utilities Trust of Australia, a private infrastructure fund – both of which are managed by Hastings Funds Management. As new supertankers have emerged, Portland, along with Hastings in Western Port Bay was proposed as an alternative to the controversial plans for deepening of Melbourne’s shallower Port Phillip. The plans are aimed at maintaining Victoria’s shipping status (since Melbourne has become Australia’s busiest port, the Victorian economy relies heavily on the import and export of goods). Due to environmental reasons, the plan to deepen Port Phillip has been heavily criticised, whereas Portland offers some of the necessary infrastructure with minimum environmental impact. The Port of Portland has received major assistance through public funding of an A$18 million overpass which gives better access to the port for heavy traffic The Glenelg Shire Council has recently adopted a plan for the redesign and development of the foreshore precinct including a new multi purpose marina in the north-west corner of the harbour. Alcoa is Victoria’s largest exporter. The Portland aluminium smelter is located in Portland in South West Victoria. The smelter was commissioned in 1987 and is managed by Alcoa World Alumina and Chemicals for Portland Aluminium (a joint venture project between Alcoa (55%), CITIC (22.5%) and Marubeni (22.5%)). Portland is Australia’s third largest aluminium smelter, with a capacity of around 352,000 tonnes of aluminium per annum. The majority of Portland’s production is supplied to the export market. The Portland Aluminium smelter, in conjunction with Alcoa’s Point Henry smelter, produce about 30% of Australia’s total aluminium. Portland today is the home of a varied professional fishing fleet of approximately 60 vessels, harvesting a wide variety of sustainable, commercial species. During the austral summer (November to May), the Bonney Upwelling (part of the larger Great South Australian Coastal Upwelling System) brings nutrient-rich deep ocean water to the surface in the Portland area, supporting a rich abundance of marine life. Trawlers target deepsea finfish such as rockling, hoki, blue eye trevalla and more, while Southern rock lobster, giant crab, blacklip and greenlip abalone, arrow squid, wrasse and others are also landed in significant quantities. The industry is a significant employer and directly generates approximately $30 million in export and domestic earnings for the town with major flow-on benefits through local seafood processing (both export and domestic), transport & engineering services, fuel supplies and other ancillary industries. An abalone hatchery has been established on the shores of Portland Bay and apart from some current difficulties, is likely to be an indicator of future seafood production. [vague] Easy access to prime locations supports a flourishing amateur angling fraternity, with many locals and tourists regularly enjoying a fresh catch of King George Whiting, Snapper, Kingfish, Flathead, Morwong and in recent times, Southern bluefin tuna. The first blades from the Vestas Portland plant were produced in July 2005 and the plant was officially commissioned in August 2005. The facility cost $9 million, and has a capacity of 225 blades (75 blade sets) per annum. Vestas began manufacturing wind turbines in 1979. Their core business comprises the development, manufacture, sale, marketing and maintenance of wind power systems. The blade manufacturing facility in Portland worked in conjunction with their assembly plant in Tasmania which has since been closed down. In August 2007, Vestas announced it will close its near new Portland blade manufacturing plant with the loss of 130 jobs. The Portland Wind Energy Project, PWEP involves the development of four wind farms at Cape Bridgewater, Cape Nelson, Cape Sir William Grant and Yambuk in south-west Victoria. As one of the biggest wind farm developments in the Southern Hemisphere, the 195MW project proponents claimed that it will deliver major environmental, economic and social benefits. The four Portland sites are considered by the proponents of the project to be ideal wind farm locations, with consistently strong winds, access for construction vehicles and machinery, a nearby connection to the National Electricity Grid, compatible farming activities and a large land area. By August 2007 construction was underway but there is still ongoing substantial resident opposition to the project regarding the planning process enabling this development and the visual impact of towers and the power lines. The 195MW project will produce enough clean electricity to power about 125,000 homes each year, equal to more than 7 per cent of Victoria’s residential electricity demand, or powering a city the size of Geelong. The project is being developed by Pacific Hydro. Geothermal heating was used to heat more than 19,000 square metres of municipal buildings, a motel and the town 2000m³ swimming pool in Portland. Commissioned in 1983, naturally hot groundwater (58 °C) was extracted from a bore (1400m deep) at a rate of 90 litres/second. The total capacity of the Portland facility, operated by the Glenelg Shire was 10.4 MW before being closed down prematurely in April 2006. The Great South West Walk is a 250-kilometre (160 mi) walking track that begins at the Visitor Information Centre, Portland. Designed as a long distance walking track, it is also ideal for short walks and day walks. The walk travels though forests, river gorges, cliff tops and sublime bays. Established in 1981 the walk is administered, maintained and promoted by ‘The Friends of the Great South West Walk Inc’, a wholly volunteer organisation, in partnership with Parks Victoria. The tram, powered by a small combustion engine, en route from Wade Street to the Henty Park depot. The Portland Cable Trams was established as a community organisation in June 1996, with the view to laying light rail to carry refurbished diesel powered trams, as both an outlet for rail and heritage enthusiasts and a tourist venture. The tram carries passengers along the scenic route from Henty Park to the World War 2 Memorial Lookout, at the old North Portland Water Tower. The route takes in the natural wetlands (tidal) of Fawthrop Lagoon Park, the foreshore, cliff tops and botanic gardens. The Portland Cable Tram Group is planning additional tram carriages and engines, for greater capacity and to provide more reliability and maintenance support options. Volunteer drivers and conductors provide a commentary about Portland’s significant past and present-day buildings, harbour and sights. Over 12,000 passengers were carried on the tram during the 2006–07 financial year. Maritime Discovery Centre, Tourist Information Centre. The Portland Maritime Museum was developed to house the Portland Lifeboat built in 1858. The Lifeboat is one of the oldest lifeboats remaining in the world. Famous for rescuing 19 survivors of the Admella shipwreck in 1859, and the Julia shipwreck in 1863. The Admella, a steamship of 392 tons, was sailing from Adelaide to Melbourne when it was smashed onto a reef off Carpenter Rocks in South Australia with a loss of 89 lives. The Portland Lifeboat and crew were taken to the scene, and were pivotal in the rescue operations. On display is a real whale skeleton, and the famed ‘Portland Lifeboat’ used in the Admella rescue. Portland is 362 kilometres (225 mi) west of Melbourne via the Princes Highway. It is connected to Hamilton by the Henty Highway. Portland is served by the standard gauge Maroona-Portland line, which branches from the main Western standard gauge line. Until 1995 the line was broad gauge, the line having been opened on 19 December 1877. Passenger movements are by coach to Warrnambool where passengers transfer to rail, the last direct passenger train between Ararat and Portland was on 12 September 1981 operated by a DRC railcar. Grain was the most common commodity delivered by rail from the Wimmera. Transport Minister Peter Batchelor, opened a $15m overpass in Cliff Street constructed for VicRoads in October 2006. The government committed to the project in May 2003, and work began in 2005. The overpass allows road transports and trains continuous access to the port; moving commodities like grain, fertiliser, wind-farm blades, aluminium ingots and woodchips. Port activity is projected to increase significantly and the overpass, which had been discussed since 1991, was finally installed. The project was completed three months ahead of schedule because of the drought and less than the expected delays due to rain. Freight operator Pacific National indefinitely suspended all rail services to the town of Portland in 2004, impacting local companies including Portland Aluminium, transport company , and freight broker Anchor Logistics. Portland container traffic was conveyed between Maroona and Portland on grain services twice a week, but Pacific National said that due to the drought there were no trains to attach the loading to. On the route the price differential between rail and road is $12.97 per tonne in rail’s favour. Pacific National closed their Portland operations in March 2008, with GrainCorp leasing a limited number of locomotives and rolling stock from them, but favour transporting grain to the Port of Geelong instead. In September 2008 it was announced that freight traffic would restart using the line from Portland, with operator El Zorro signing a multi-million deal with miner Iluka Resources to carry containerised mineral sands to Melbourne, with Iluka saying rail transport was cheaper than road. Portland is served by the Portland Airport (IATA: PTJ, ICAO: YPOD) which is served by one commercial airline, Sharp Airlines flying 22 weekly flights to Melbourne using 19 seat Fairchild Metroliner turboprop aircraft. Sharp Airlines is a small airline company formed in Hamilton (1990) which began flying regularly out of Portland to Essendon Airport. They have flights Warrnambool to Melbourne. Sharp Airlines started in Portland by flying staff and employees from Portland Aluminium to Avalon Airport, so they could link to the Point Henry Smelter near Geelong. With significant demand and the support of the community, non-charter, passenger flights were also added. Sharp has established a maintenance hub at Portland Airport, so support staff could service the growing commuter and tourist airline. Community radio station 3RPC-FM 99.3 is located opposite The Arts Company, on the corner of Richmond Street, and broadcasts to the majority of the Shire of Glenelg. This too lends itself to the promotion of the city’s various performances, exhibitions and cultural events. Each week volunteer presenters write and produce many hours of on-air entertainment covering arts, culture, sport, community news and special interest programs. Portland tourist radio station is WAVE-FM, broadcasting easy listening music, news and information about local attractions. Mosaic work fostered by community arts programs. This seat is located in beachfront Bentinck Street. Portland has a vibrant cultural diversity, with many potters, painters, musicians, quilters, lead lighters, wood-turners, photographers, cinematographers, multi-media artists, print-makers, jewellers, sculptors, actors and writers. Many of these talents come together under the banners of CEMA Inc (Council for Encouragement of Music and the Arts), or the associated The Arts Company. The Portland Art Centre, on the corner of Glenelg and Bentinck Streets, incorporates a gallery and theatre, where local and visiting performances are regularly staged. The Arts Company is located in the heritage precinct of Portland in refurbished old buildings in Julia Street. Along with community workshops and studios, local artists’ works are also for sale. The Arts Company also has accommodation and studios for the artist in residence programs. The town has an Australian rules football team competing in the Hampden Football League. The club is known as Portland Football Netball Cricket Club. Golfers play at the course of the Portland Golf Club on Madeira Packet Road. Portland also has a soccer team, the Portland Panthers, and they play most of their games with the Mount Gambier Sides. Portland has a warm-summer mediterranean climate that is transitional with the oceanic climate (Köppen climate classification csb/cfb). Its summers are moderated by its shoreline position, whereas the rainy winters have moderate lows. The weather in winter is freezing and the ocean air blows an extremely cold breeze over the town. ^ Australian Bureau of Statistics (27 June 2017). “Portland (Urban Centre/Locality)”. 2016 Census QuickStats. Retrieved 4 January 2019. ^ Butler, S., ed. (2009). “Portland”. Macquarie Dictionary (5th ed.). Sydney: Macquarie Dictionary Publishers Pty Ltd. ISBN 978-1-876429-66-9. ^ “The History of Portland”. Portland Guardian (EVENING ed.). Vic. 16 June 1930. p. 4. Retrieved 21 February 2012 – via National Library of Australia. ^ State Library of Victoria. “Images and transcripts of Edward Henty’s journal”. Archived from the original on 2 June 2009. Retrieved 11 May 2009. “PICTURESQUE VICTORIA”. The Argus. Melbourne. 15 November 1884. p. 4. Retrieved 7 November 2011. ^ “Henty Days”. Portland Guardian (EVENING. ed.). Vic. 13 January 1927. p. 4. Retrieved 28 January 2012 – via National Library of Australia. ^ Premier Postal History. “Post Office List”. Archived from the original on 2006-08-28. Retrieved 2008-04-11. ^ “Obituary – From the Portland Herald”. . Melbourne. 28 February 1854. p. 7. Retrieved 30 June 2015 – via National Library of Australia. ^ Scars on the Landscape: A Register of Massacre sites in Western Victoria 1803–1859 by Ian D. Clark, Aboriginal Studies Press, Acton (ACT) 1995, pp. 17–22 ISBN 0-85575-281-5. An excerpt was also published on Museum Victoria website when accessed on 26 November 2008. ‘^ The People of Budj Bim: Engineers of aquaculture, builders of stone house settlements and warriors defending country by The Gunditjmara People with Gib Wettenhall, em Press, Mollongghip (Vic) 2010, pp. 16–27. ^ Lovett on behalf of the Gunditjmara People v State of Victoria  FCA 474 (30 March 2007), Federal Court (Australia). ^ Lovett on behalf of the Gunditjmara People v State of Victoria (No 5)  FCA 932 (27 July 2011), Federal Court (Australia). ^ “Portland – Live in Victoria”. Archived from the original on 5 January 2016. Retrieved 28 December 2015. ^ “Portland Upwelling Festival – The Bonney Upwelling”. Archived from the original on 26 March 2014. Retrieved 12 July 2013. ^ Butler, A. J., F. Althaus, D. M. Furlani, and K. R. Ridgway. Assessment of the Conservation Values of the Bonney Upwelling Area: A Component of the Commonwealth Marine Conservation Assessment Program 2002–2004: Report to Environment Australia. Archived 2 June 2012 at the Wayback Machine Published by CSIRO Marine Research (now CSIRO Marine and Atmospheric Research) and Environment Australia, Dec. 2002. Accessed 12 July 2013. ^ Victorian Legislation and Parliamentary Documents (2005). “New Wind Farm Blade Factory is a Boost for Portland”. Victorian Legislation and Parliamentary Documents. Archived from the original on 24 September 2007. Retrieved 31 August 2007. ^ Freehills.com (2004). “Portland Wind Energy Project to commence”. Freehills.com. Retrieved 31 August 2007. ^ Pacific Hydro (2007). “Portland Wind Project”. Pacific Hydro. Archived from the original on 29 August 2007. Retrieved 31 August 2007. ^ a b RISE – Research Institute for Sustainable Energy (2006). “History of Geothermal Power Systems”. RISE – Research Institute for Sustainable Energy. Retrieved 31 August 2007. “Temporary Measures to Replace Bore – 19/4/2006”. Glenelg Shire Council. 19 April 2006. Archived from the original on 9 May 2006. ^ Department of Primary Industries (2007). “Geothermal Energy – Discovering Victoria’s Potential”. Department of Primary Industries. Archived from the original on 30 March 2007. Retrieved 31 August 2007. ^ Portland Cable Trams. “General Happenings”. Portland Cable Trams. Retrieved 31 August 2007. ^ Chris Banger (March 1997). “Rail Passenger Service Withdrawals Since 1960”. Newsrail. Australian Railway Historical Society (Victorian Division). pp. 77–82. ^ “BATCHELOR IN PORTLAND OPENING NEW RAIL/ROAD GRADE SEPARATION”. Media Release: MINISTER FOR PUBLIC TRANSPORT. www.legislation.vic.gov.au. 26 October 2006. Archived from the original on 17 September 2007. Retrieved 2 July 2008. ^ “WORKS BEGIN ON $15 MILLION CLIFF STREET OVERPASS PROJECT”. Media Release: MINISTER FOR PUBLIC TRANSPORT. www.dpc.vic.gov.au. 23 November 2005. Archived from the original on 19 May 2011. Retrieved 2008-07-02. ^ “Rail freight back on Portland-Maroona line”. ABC News. www.abc.net.au. 3 September 2008. Retrieved 2008-09-04. ^ Portland Arts Company. “Portland Arts Company”. Portland Arts Company. Archived from the original on 29 August 2007. Retrieved 31 August 2007. ^ Golf Select. “Portland”. Retrieved 2009-05-11. ^ “Climate statistics for”. Bureau of Meteorology. Retrieved 18 January 2014. Ian D Clark (2003) 'That’s my country belonging to me’ – Aboriginal land tenure and dispossession in nineteenth century Western Victoria, Ballarat Heritage Services, Ballarat. “Portland (Victoria)” . Encyclopædia Britannica (11th ed.). 1911.